A worried local resident has slammed "ludicrous" plans for a controversial development at a Chesterfield quarry. Derbyshire NSF Ltd, based in Staveley, is seeking planning permission to extract between 5,000 and 6,000 tonnes of stone at Alton Quarry, Alton, each year. Victoria Head, 48, from Alton, a member of Alton Quarry Action Group, said: "These are ludicrous and ridiculous plans. Everyone is against this proposed development. 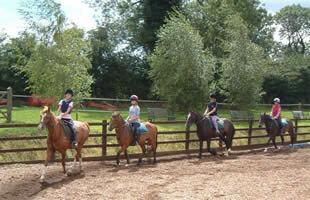 The quarry is adjacent to a public footpath and is next to a riding school. There are serious health and safety risks to people using these, as there will be an increase in noise, dust and vehicular movement in this lovely, quiet and peaceful area. I'm extremely concerned." In a statement, Derbyshire NSF Ltd said: "Our proposal is a small scale, low intensity, natural building stone extraction operation that will be undertaken within the existing quarry void. The proposal does not involve blasting." The company said the plans would not lead to "unacceptable levels of noise" or "create a dust nuisance" and vehicular movement would be "barely noticeable". "Therefore, there are no serious health and safety issues," it added.